Much of Heather Ross’s creative work has been inspired by her being born into an eccentric family of artists and idealists in a rural corner of Vermont during the 1970s. 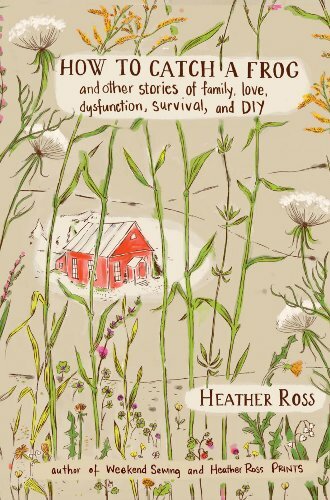 According to Heather, that environment was defined by stunning natural beauty, creative and innovative living, and daily lessons in self-reliance. It also included equal parts of general dysfunction, a self-imposed but nearly inescapable poverty, and little exposure to basic life skills. When, as a twenty-something, Heather complained to her mother about a long list of things she had missed out on and that had compromised her chance of ever leading a “normal” life (immunizations, a healthy respect for authority), her mother waved a hand and replied, “Well, you should thank me, because you have a lot of good stories instead.” How to Catch a Frogis a collection of those stories, plus others that show Ross's eventual route to success as an artist, entrepreneur, and mother, all animated by Ross’s delightful illustrations and how-to instructions.